Chromosome 18q- is complex. It is not a one size fits all condition and so it is massively important to gain the most varied, up to date and relevant information to best help our children. 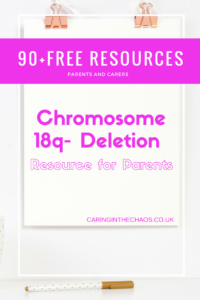 Below is a MEGA list of resources for 18q- parents. Ranging from eye impairment help, hearing and communication guidance or physiotherapy sign posting. Okay not quite 90! I miscounted but this will be updated soon so it will be pushing 90 soon!